Today is Guru-purnima. Srila Prabhupada has explained that the system of honoring the spiritual master is current in all sections of Vedic followers. In the Mayavadi (impersonalist) sects, disciples offer respect to the spiritual master once in a year, on Guru-purnima. 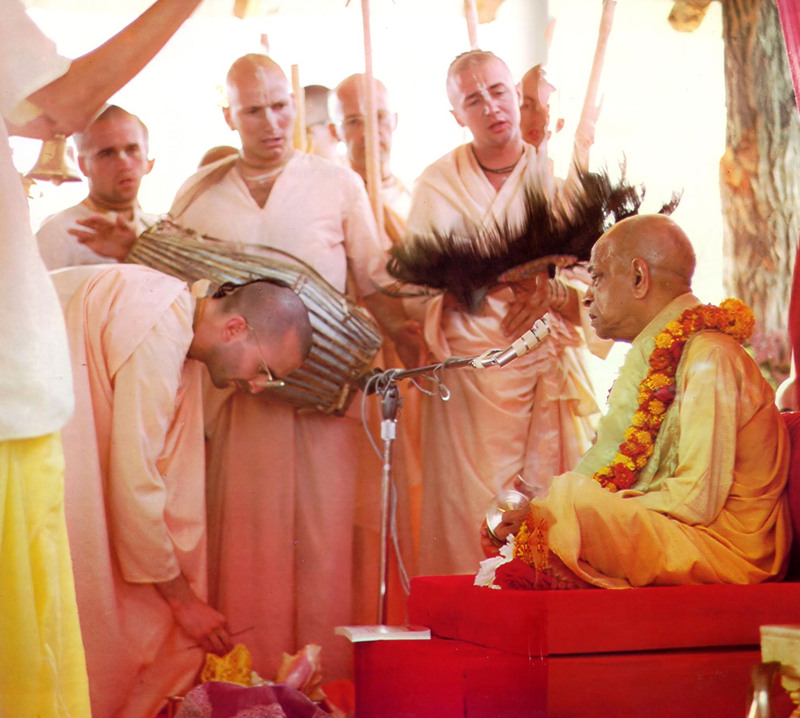 And in the Gaudiya Vaisnava sampradaya, disciples also offer homage annually—on the appearance day of the spiritual master, an occasion called Vyasa-puja because the spiritual master, through disciplic succession, presents the same knowledge as Vedavyasa, the empowered incarnation of Krsna who compiled the Vedic literatures. We shall take this opportunity to discuss the principle of guru—and glorify the acarya-sampradaya. Guru is a deep subject. We sing, vande ’ham sri-guroh sri-yuta-pada-kamalam sri-gurun vaisnavams ca, offering respects to the individual spiritual master, to the predecessor acaryas, and to all Vaisnavas. As Srila Prabhupada explains, “The offering of respect to the spiritual master means offering respect to all the previous acaryas. Gurun means plural number. All the acaryas, they are not different from one another, because they are coming in the disciplic succession from the original spiritual master and they have no different views.” Thus we offer respects to the predecessors. For us in ISKCON, Srila Prabhupada is the main guru; he is the founder-acarya. But he also has his associates—Srila Gour Govinda Swami Maharaja, Srila Tamal Krishna Goswami Maharaja, Srila Sridhar Swami, Srila Bhakti Tirtha Swami, Srila Bhaktisvarupa Damodara Swami—to name some prominent ones who have departed. And of course, Prabhupada is being served by so many others today, and we can serve and learn from all of them. The original guru is Krsna. He speaks the knowledge of Bhagavad-gita and enunciates the principles of religion. Dharmam tu saksad bhagavat-pranitam: the principles of dharma—bhagavata-dharma, prema-dharma—are enacted by the Supreme Personality of Godhead. Dharma means “the laws of God,” or “the orders of God.” We cannot manufacture it; dharmam tu saksad bhagavat-pranitam: the principles of religion are enacted by the Lord Himself. We cannot make religious principles any more than we can make our own laws. Srila Prabhupada gave the example that you can’t just get together with some friends and pass your own laws. Law means that it must be enacted by the government, by the parliament or legislature. Similarly, dharma is enacted by God. The conclusion of the Bhagavad-gita is sarva-dharman parityajya mam ekam saranam vraja—to give up all varieties of dharmas and just surrender to Krsna. And to understand the confidential truths about religious principles and the knowledge of the Bhagavad-gita, we need the help of mahajanas, authorities in Krsna consciousness—gurus. This confidential knowledge is given by God in scriptures and passed down through disciplic succession (evam parampara-praptam) to great souls who in turn impart the knowledge to their eager followers. And of all scriptures, Srimad-Bhagavatam is considered the most important, the ripened fruit of the tree of Vedic knowledge. This nectarean fruit is passed down to us through disciplic succession. In commenting on this verse, Srila Visvanatha Cakravarti Thakura gives the example of a mango tree. To get a ripe mango from the top of a tree, different boys climb onto different branches. The boy at the top plucks the fruit and hands it to the boy on the next branch down, that boy hands it to the one on the next branch, and so on, until finally it reaches the boy on the ground—in the same perfect condition as it was when at the top of the tree. It hasn’t been bruised or broken but has been delivered intact, just as it was. At the top of the tree is Krsna, and He passes down the knowledge to Brahma. Brahma passes it to Narada, and Narada passes it to Vyasa. (Today is also called Vyasa Purnima because Vyasadeva, who compiled the Vedic literature, appeared on this date.) Vyasa passes it to Madhvacarya, and so on—Caitanya Mahaprabhu, the Six Gosvamis, and further down, Srila Bhaktivinoda Thakura, Srila Gaurakisora dasa Babaji Maharaja, Srila Bhaktisiddhanta Sarasvati Thakura, and Srila Prabhupada. And now the followers of Srila Prabhupada are presenting the same knowledge. They follow and present the same teachings—that is their qualification. “Before the creation of this cosmic manifestation, the Lord enlightened the heart of Lord Brahma with the details of the creation and manifested the Vedic knowledge. In exactly the same way, the Lord, being anxious to revive the Vrndavana pastimes of Lord Krsna, impregnated the heart of Rupa Gosvami with spiritual potency. By this potency, Srila Rupa Gosvami could revive the activities of Krsna in Vrndavana, activities almost lost to memory. In this way, He spread Krsna consciousness throughout the world.” (Cc Madhya 19.1) Lord Caitanya also empowered him to write books on bhakti-yoga, and the same could be said about Sanatana Gosvami. A few weeks ago we were fortunate to receive four visitors from Dallas, disciples of Tamal Krishna Goswami—Dharma dasa and his wife Urjesvari, her sister Saibya, and Padma dasi. At the same time, Mayapur dasa, Sridhar Swami’s personal servant for many years, was also with us. So we thought it a good occasion to glorify these two stalwart servants of Srila Prabhupada, these two powerful preachers, Tamal Krishna Goswami and Sridhar Swami. And it was very enlivening and purifying. All of the devotees spoke so beautifully—each and every one—and one could really feel Tamal Krishna Goswami’s and Sridhar Swami’s presence and really feel united with Srila Prabhupada and his associates. His Holiness Niranjana Swami also spoke very beautifully and led kirtana. Although all of Srila Prabhupada’s direct disciples are godbrothers and godsisters in that we were all initiated by His Divine Grace, still, among Srila Prabhupada’s followers there are some who were—and are—really leading the movement and showing the way for others to follow. Certainly His Holiness Tamal Krishna Goswami was a great pioneer, as were His Holiness Sridhar Swami and the others I mentioned. And even now devotees are following Srila Prabhupada and leading us and showing us the way. We also are trying to make our little contributions, but still, there are some who are ahead of us, showing the way and making it easier for us to follow. At the same time, it is also very personal and individual—through whom Krsna speaks to whom. It is not that everyone has to follow only one particular person. Krsna can manifest Himself—and Srila Prabhupada can manifest himself—through different servants, different Vaisnavas, and we should be open to that flow of mercy however and through whomever it comes. It is not fixed or rigid. That mercy can come in different ways, and we should be open to it. That is really the principle of guru: Krsna’s instructions come to us through some servant of Krsna, some representative of Krsna—and it is not limited to only one. Krsna can speak to us through many mouths, through many personalities, and we should be open to that guidance. We should take His instructions on our head and follow them. That is how Krsna guides the conditioned souls back home, back to Godhead. He can engage any number of His servants to help us; God knows we need all the help we can get. So we shouldn’t be sectarian. We shouldn’t cut ourselves off from any flow of mercy that may come to us by the arrangement of the Lord, or of Srila Prabhupada, or of any of our spiritual masters. I think of the example of Raghunatha dasa Gosvami, because he had so many gurus. Of course, he was a direct associate of Lord Caitanya Himself, but even then, he was helped by so many well-wishers and guides. First, he was initiated by Yadunandana Acarya, Raghunatha’s family’s spiritual master. Yadunandana Acarya himself was a great Vaisnava, an initiated disciple of Advaita Acarya and an intimate student of Vasudeva Datta. And Balarama Acarya, a dear associate of Haridasa Thakura, was Raghunatha’s family’s priest. Raghunatha learned from him too. Balarama Acarya and Yadunandana Acarya were friends, and both used to host Haridasa Thakura at their homes. For some time, Balarama Acarya provided Haridasa with a thatched hut and prasada, and at that time, while still a student, Raghunatha visited Haridasa Thakura daily, and it is said that because of the mercy Haridasa showed him then, Raghunatha later attained the mercy of Sri Caitanya Mahaprabhu. Once, Balarama Acarya invited Haridasa Thakura to speak in the assembly of Raghunatha’s family, the Majumadaras, and thus Raghunatha heard from him again, about the glories of the holy name. Eventually, Raghunatha dasa met Nityananda Prabhu at Panihati and got His benediction to become free from all obstacles and attain shelter at the lotus feet of Sri Caitanya Mahaprabhu. Soon, Raghunatha escaped from home, traveled by foot to Puri, and attained the merciful shelter of Sri Caitanya Mahaprabhu—by the mercy of Nityananda Prabhu. Then, Caitanya Mahaprabhu entrusted Raghunatha dasa to Svarupa Damodara Gosvami: “I entrust Raghunatha to you. Please accept him as your son or servant.” Raghunatha was still very young, only about twenty-two. The Lord took Raghunatha’s hand and personally placed him in the hands of Svarupa Damodara Gosvami. And so Raghunatha became Svarupa Damodara’s assistant. Svarupa Damodara was Sri Caitanya Mahaprabhu’s secretary, and Raghunatha dasa in effect became assistant secretary. Raghunatha dasa felt so much separation that he decided to go to Vrndavana to see the lotus feet of Rupa and Sanatana and then give up his life by jumping from Govardhana Hill. But the two brothers would not allow him to die. They prevailed upon him to stay with them and speak about Mahaprabhu’s later pastimes. “You should not give up your life,” they told him. “You were with Sri Caitanya Mahaprabhu in Puri and were witness to so many of His intimate pastimes. You should stay with us and tell us about your experiences with Him.” And they accepted him as their third brother. Especially Sanatana Gosvami gave him shelter and took care of him. At first, when Raghunatha dasa Gosvami was doing bhajana at Radha-kunda, he didn’t have any residence. And while doing his bhajana, he was pretty much oblivious to everything else. He would chant, but he could hardly chant sometimes, because he would go into trance. Still, he chanted at least one lakh names every day. But it could happen that he would chant one name and then go into deep trance, and the pastimes of Krsna would play in his mind. Like that, he was chanting Krsna’s name and remembering Krsna’s pastimes one day, and the hot sun was beating down on his head. Srimati Radharani Herself then came and held a cloth over his head, but he didn’t know it, because he was in deep meditation. But Sanatana Gosvami understood, and he personally built a bhajana-kutira for Raghunatha dasa Gosvami. He took care of Raghunatha dasa in every respect. In this verse, Raghunatha dasa Gosvami describes Sanatana Gosvami with a phrase that Srila Prabhupada often quoted (for all compassionate Vaisnavas): para-duhkha-duhkhi—“he felt sorrow in the sorrow of others.” Raghunatha dasa says, vairagya-yug-bhakti-rasam prayatnair—he gave me the nectar of devotional service enriched with renunciation; anabhipsum andham—but I was unwilling (anabhipsum) to drink it, because I was blind (andham) to my spiritual well-being; so apayayan mam—he forced me to drink it. Sanatana Gosvami is an ocean of mercy (krpambudhi), and therefore I offer my respectful obeisances to him. I take shelter of him, my master (prabhum asrayami). Srila Prabhupada paraphrased this verse in composing a verse to honor his sannyasa-guru, Srila Bhaktiprajnana Kesava Gosvami Maharaja. He used almost the same words. The idea is that it is very hard to become free from the shackles of family life. Of course, one can be a pure devotee in the grhastha-asrama—that is another thing—but to preach, sannyasa may be advised. As Srila Prabhupada describes it, he was having recurring dreams that his guru maharaja was calling him to follow him and preach. And he would wake up horrified: “How can I take sannyasa and become a mendicant? How can I leave my wife and children? What will happen then?” Eventually Prabhupada accepted vanaprastha. He went to Jhansi and began the League of Devotees there. But there was some politics. The wife of the governor wanted the property that Srila Prabhupada had been using for the League. She made all efforts to get it for some ladies’ program, and because she was so influential, Prabhupada decided not to fight against her. So he left and went to Mathura, where he stayed in the matha of his godbrother Bhaktiprajnana Kesava Gosvami Maharaja. And Kesava Maharaja insisted, “You must take sannyasa.” To fully take up the order of the spiritual master and preach, one must accept the renounced order of life. And so Prabhupada did—he took sannyasa. So, Sanatana Gosvami was a great shelter to Vaisnavas in Vrndavana. He was not only intelligent—all the Gosvamis were most intelligent—he was also very shrewd, very clever; he understood politics and diplomacy. It is said that Rupa Gosvami was very simple but that Sanatana Gosvami was very astute; he could understand people’s motives and intentions. So he was able to protect devotees in the most practical ways, because he had that type of intelligence. And he protected Raghunatha dasa Gosvami on every level. Then, on the day of Guru-purnima, because Sanatana Gosvami was the seniormost of the Gosvamis and the siksa-guru of almost everyone in Vrndavana, the Vaisnavas went to Govardhana to offer him respects. Upon their arrival at his bhajana-kutira at Manasi-ganga, they saw that he was in trance. He didn’t move at all. So they waited. They didn’t want to disturb him. Eventually they understood that he had left, and they all were overwhelmed with separation. They took him on parikrama of Govardhana Hill, as he had faithfully done parikrama of Govardhana Hill every day. But they weren’t sure where to place his body. Jiva Gosvami, who was the leader after Sanatana, decided that they should bring him back to Vrndavana, close to the temple of the Deity of Madana-mohana, who was so dear to him. So, that took place on Guru-purnima. We can see how the devotees helped each other. Everyone helped everyone. In Sri Caitanya-caritamrta, we find that the Vaisnavas were always helping each other. And we should learn from their example. We should develop that mood. Of course, help can come in different ways. Sometimes it comes in terms of instruction, and sometimes it comes in practical ways, like Sanatana Gosvami’s building Raghunatha dasa Gosvami’s bhajana-kutira. These exalted devotees were always serving each other—serving Sri Caitanya Mahaprabhu and serving each other. And that should be our mood: to serve each other, actually help each other—and to learn from each other. In the Eleventh Canto of Srimad-Bhagavatam, we learn how an avadhuta brahmana took lessons from others, from twenty-four siksa-gurus: the material elements, natural phenomena, plants, animals—even from a prostitute. By his intelligence, he learned from all of them, and he accepted them all as his gurus. For example, he learned from the mountain that a saintly person should devote all his efforts to the service of others and make their welfare the sole reason for his existence (as we learn from Govardhana Hill). From the python he learned that one should give up material endeavor and accept what comes of its own accord—one should remain peaceful and steady, indifferent to material gain but always alert to self-realization. Even from Pingala, a prostitute, he learned. Because she had no other source of income, she was very anxious for customers. One night she was waiting, waiting, waiting, and still no customer came. Finally, at the end of the night, she felt disgusted with her situation and thus became detached. From Pingala he learned detachment—and attachment for the Supreme Personality of Godhead, whom she accepted as her ultimate shelter and object of love. So we can learn from anyone and anything. If we are sincerely trying to serve Krsna and to understand how best to serve Him, the Lord in the heart will give us the intelligence how to learn from others—even from trees and grass. Caitanya Mahaprabhu glorified the trees and grass, for from them we learn how to be tolerant and humble. So we can learn from anyone and everyone, and everything. We can learn even from demons—and we are surrounded by them. Big business people, with their advertising and other strategies, are so clever. We should be that shrewd, that clever, for Krsna. Materialistic leaders figure out how to trap people in their nets and pull them in and keep them. We can learn from such powerful materialists how to attract people and keep them, for Krsna—how to be organized and intelligent, for Krsna. If we are in the proper mood, anything can remind us of devotional service and be used for Krsna’s benefit. Anyone can be a siksa-guru for us if we are absorbed in the mood of serving Krsna, fixed in Krsna consciousness. But in particular, and especially on occasions like today, we are enjoined to offer respectful obeisances unto our diksa– and siksa-gurus in the disciplic succession, from Krsna to Brahma to Narada to Vyasa, from Caitanya Mahaprabhu to Sanatana Gosvami, from Srila Prabhupada to his followers, which include all of you. pls mail us all lectures of Guru Maharaj and transcribed lectures also. If any service for transcription etc. pls engage us.